The Mesopotamians use round cylinder seals for rolling an impress of images onto clay tablets. In other early societies in China and Egypt small stamps are used to print on cloth. These stamps are gradually replaced by larger wooden blocks. 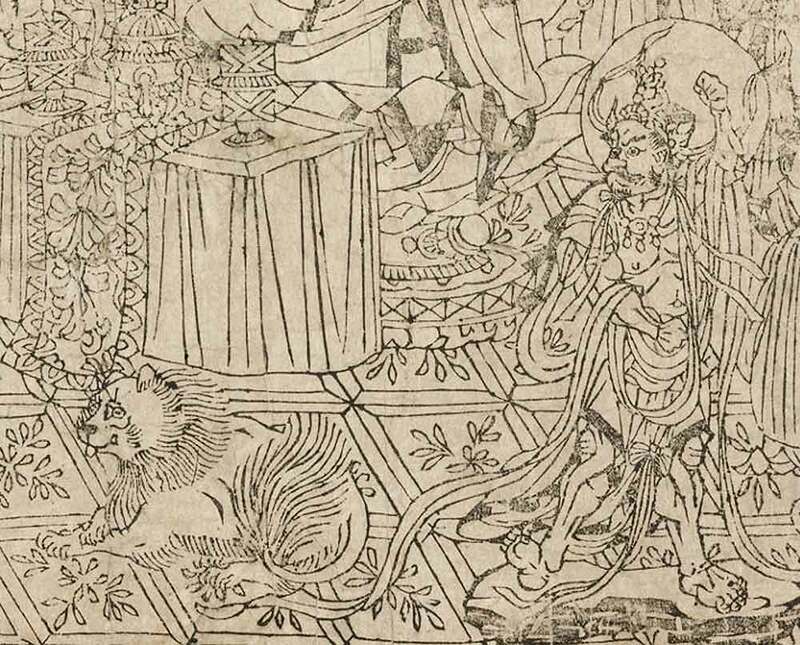 In China such woodblocks are used to print on silk. The earliest known examples consist of flowers printed in three colors. They are likely produced during the Han dynasty (before 220 BC). Printing plates such as the one shown below are still being investigated. If they are genuine, the Harappan civilization in the Indus Valley is the first one to use fairly modern printing techniques. 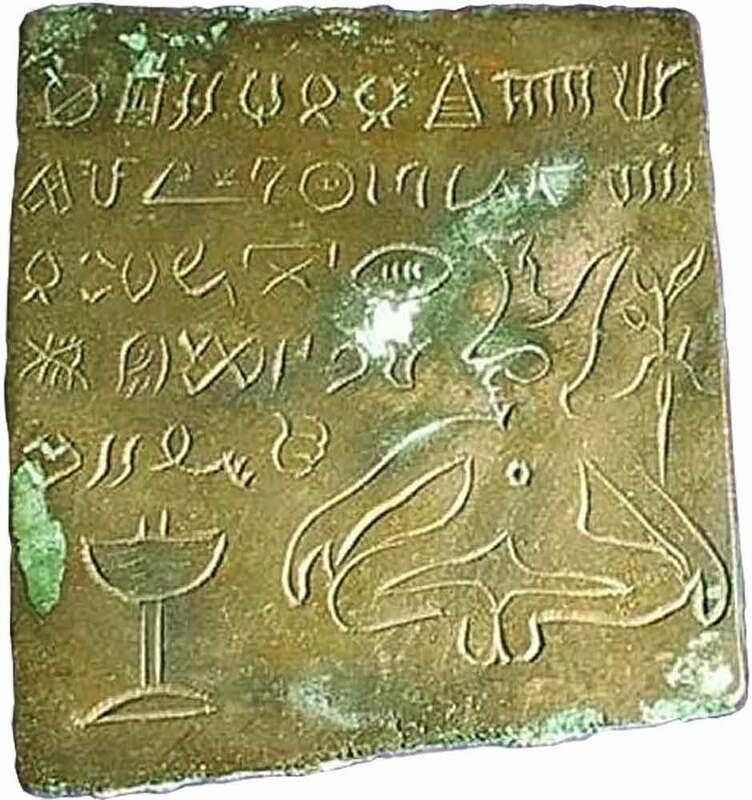 One of the plates bears 34 characters, which is the longest known single Indus script inscription. The Prisse Papyrus is an Egyptian scroll that is considered the oldest surviving book. The first Acta Diurna (Latin for ‘Daily Acts’) are published in Rome in 131 BC. These are daily official notices of the Roman Empire and can be considered the first newspapers. The notices are carved on stone or metal, they do not get printed. Scribes sometimes do make copies to be sent to the provinces. A few decades earlier parchment is invented. This writing material is made from specially prepared untanned skins of animals, mainly sheep, calves and goats. It will be used by many cultures for over a thousand years and is believed to be invented by King Eumenes II of Pergamon, a Greek city-state in what is now Turkey. A Chinese man named Ts’ai Lun is credited with inventing paper around 105 AD. He takes the inner bark of a mulberry tree and bamboo fibers, mixes them with water and pounds them with a wooden tool. This mixture is poured onto a flat piece of coarsely woven cloth and left to dry, leaving only the fibers on the cloth. 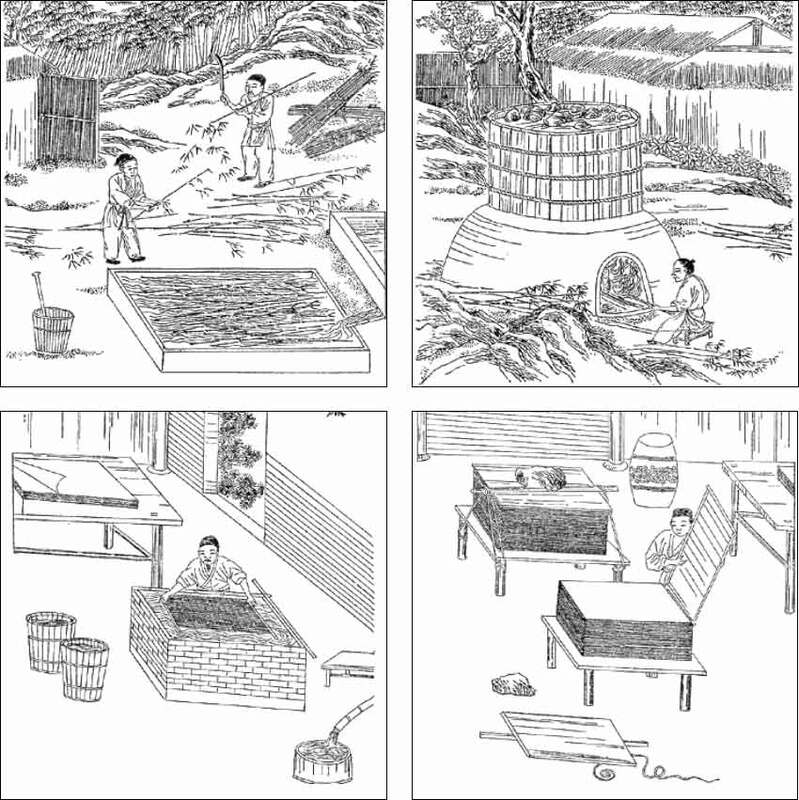 The Ming dynasty woodcuts below show various stages of the production process. From China the knowledge of paper making is passed along to Korea, Samark, Baghdad and Damascus. The Nag Hammadi codices, also known as the ‘Chenoboskion Manuscripts’ are the oldest surviving bound books. They are made of papyrus sheets cut from a scroll and bound in sheepskin and goatskin leather. The cover has flaps that can be wrapped around the closed book. Leather thongs are used to keep the books shut. In 687 a small book containing the text of the Gospel of John in Latin is added to the grave of Saint Cuthbert. In 1104 it is recovered from his coffin in Durham Cathedral, Britain. The Cuthbert Gospel is currently the oldest European book still in existence. During the Battle of Talas, near Samarkand in 751 AD, the secret of paper production is made known to the Islamic world, as some of the Chinese prisoners are paper makers. A copy of the Chinese version of The Diamond Sūtra (or Diamond Cutter of Perfect Wisdom) is the earliest surviving example of a printed book. It is produced in 868 AD using woodcut, a relief printing technique in which text and images are carved into the surface of a block of wood. The printing parts remain level with the surface while the non-printing parts are removed, typically with a knife or chisel. The wood block is then inked and the substrate pressed against the wooden block. During the Song Dynasty the Chinese invent screen printing. With this printing technique a mesh is used to transfer ink onto a substrate, except in areas made impermeable to the ink. Initially the mesh is made from human hair, later on silk is used. Meanwhile woodcut printing continues to be used in China. Around 932 politician Feng Dao manages the printing of 150 books, all of them Confucian classics. 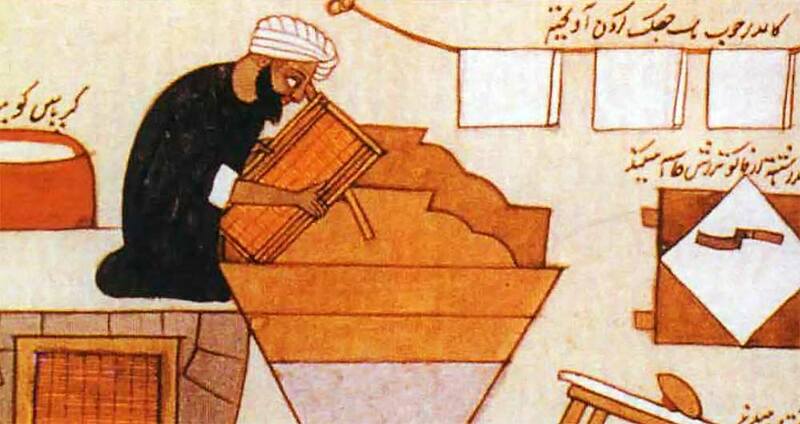 Arabs create a finer sheet of paper by substituting linen fibers for wood and bamboo. In 1023 the Chinese emperor establishes a Bureau of Exchange which is charged with issuing what can be considered the first government-issued banknotes. Chinese merchants had already been issuing banknotes themselves since the Tang Dynasty (618–907). 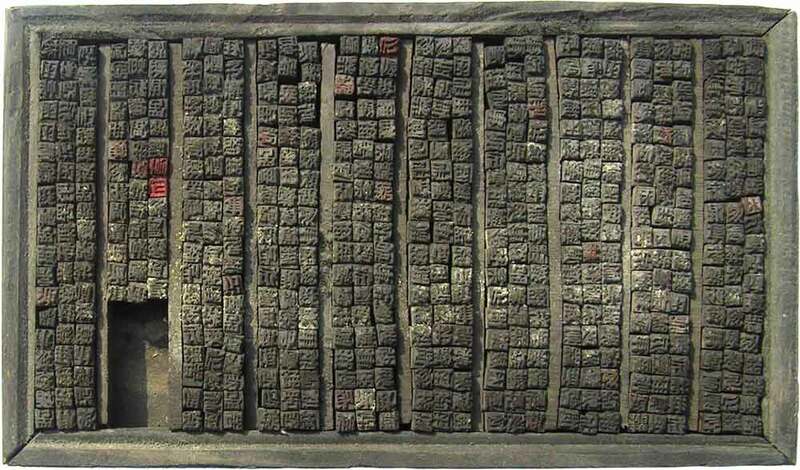 A Chinese man named Bi Sheng (or Pi-Sheng, depending on the source) develops type characters from hardened clay, creating the first movable type in 1041. The fairly soft material hampers the success of this technology. Around 1150 the first European paper mill is established in Xàtiva, a city in Spain. Since paper is mainly produced by Muslims it is frowned upon and there are even laws that forbid the use of paper for government documents. 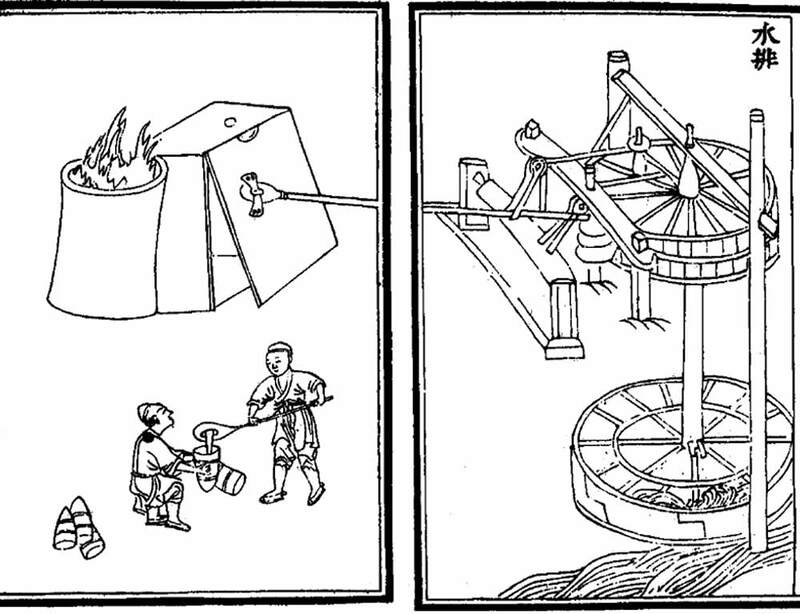 The illustrations below are woodcuts from Jost Amman, used in the ‘Book of trades’ from 1568. 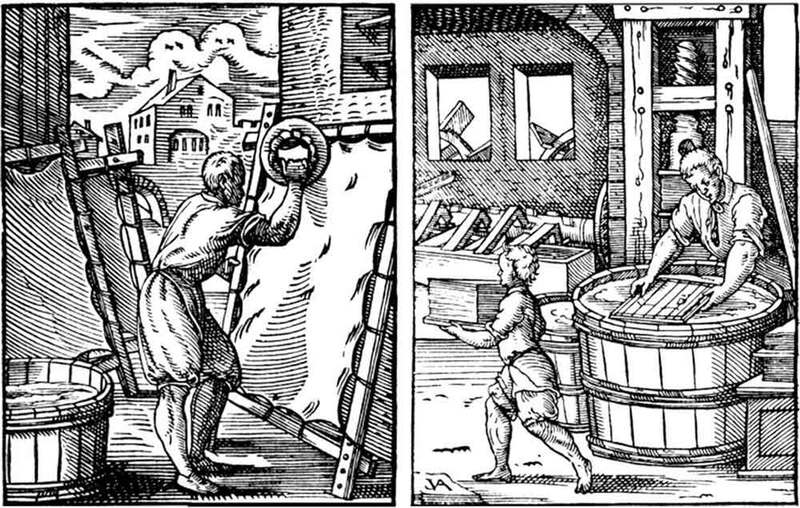 They show a parchment maker scraping off a skin to the left and a paper maker to the right. Textile printing reaches Europe via the Islamic world. Since books are copied by hand, they are rare and expensive. A copy of Justinian’s law codes costs £40 in 1240, which is as much as a house or eight year’s income for a craftsman. In 1282 watermarks appear for the first time when they are added to paper in Fabriano, Italy. Around 1313 a Chinese magistrate named Wang Zhen commissions the carving of more than 60,000 characters on movable wooden blocks. These are used to print a treatise on contemporary technologies, such as water mill powered bellows. Next to wood, bronze also starts being used to cast type characters in China, Japan and Korea. 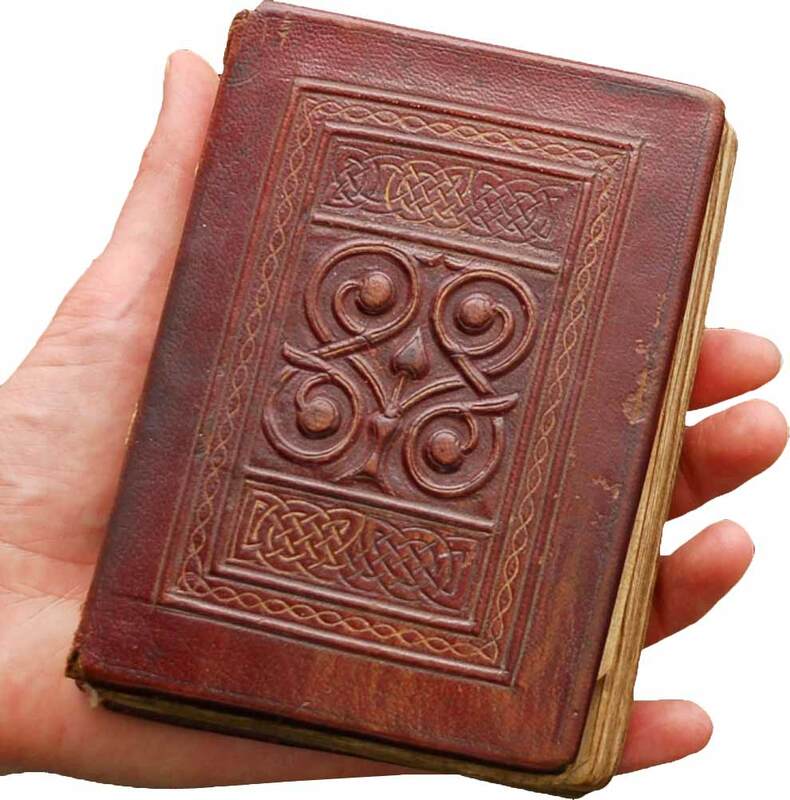 The oldest known book printed using metal type dates back to the year 1377. 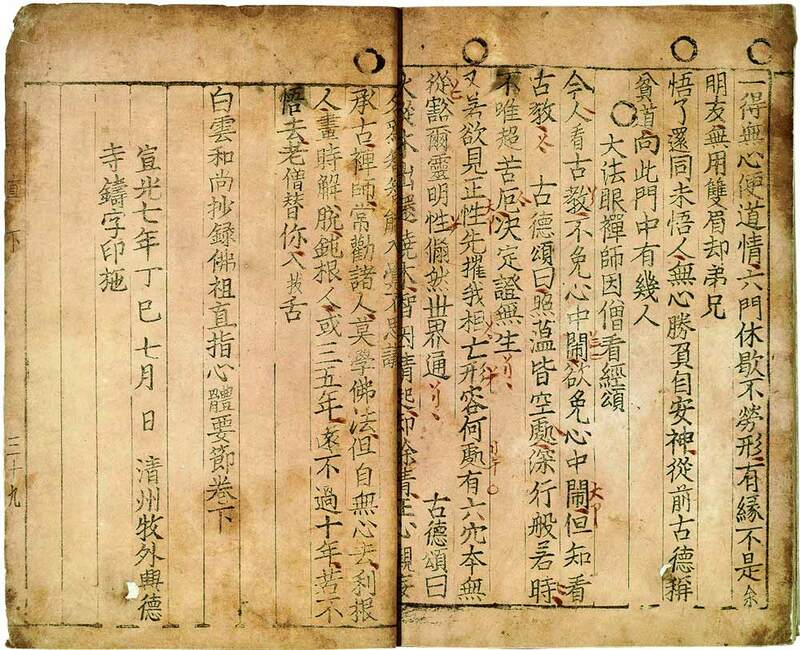 It is a Korean Buddhist document, called Selected Teachings of Buddhist Sages and Seon Masters. Its abbreviated title is Jikji and from the original two volumes only a single copy of the last one still exists. It is kept in the National Library of France. Great article! Can you please tell me where you got these images? I want to use for my project and want to check if they are free to use. I have a ancient old master wood cut found from king Solomon. Can you be of assistance with a old master wood cut type Relief ? Respectfully , John M.McNally 3rd. Maybe one of the visitors can help. A better description of your problem would help.